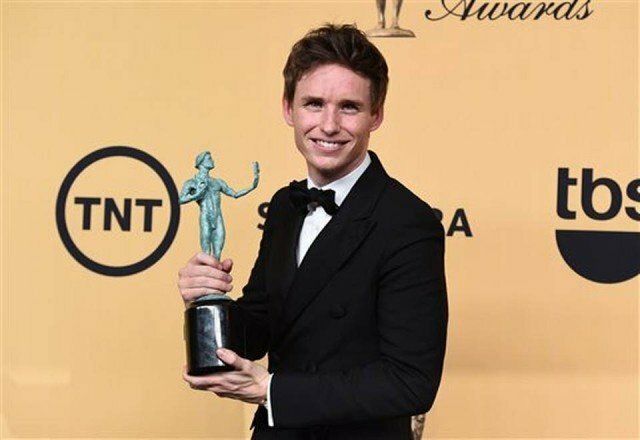 Eddie Redmayne has won best actor at this year’s Screen Actors Guild awards raising his chances of Oscars success after beating favorite Michael Keaton to win. Eddie Redmayne took the award for his role in The Theory of Everything. Michael Keaton and the rest of the Birdman cast did, however, win the award for best ensemble cast at Sunday’s ceremony. Viola Davis was named outstanding lead actress in a drama for How to Get Away With Murder, while Uzo Aduba was honored for her role in Orange is the New Black. The Netflix series, set in a women’s prison, also won best comedy ensemble cast. Downton Abbey won best ensemble cast in a TV drama for a second time. Michael Keaton had been expected to pick up the best actor award but was beaten by Eddie Redmayne, who plays a young Stephen Hawking in The Theory of Everything. The actor led the Birdman cast on stage to accept the ceremony’s main award – best ensemble cast – and called acting “the ultimate team sport”. Julianne Moore continued her winning streak by taking home the best actress in a film award for Still Alice, where she plays a professor suffering from early-onset Alzheimer’s. Other winners included Kevin Spacey for House of Cards and William H. Macy for Shameless. Frances McDormand won best actress in the same field for her part in HBO’s Olive Kitteredge.